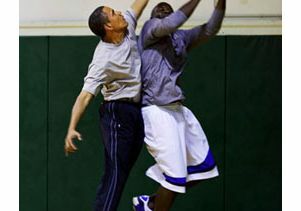 Reggie Love (at right) finds his shot blocked by President Barack Obama on a basketball court at St. Bartholomew Church in New York City on Sept. 23, 2009. Official White House photo by Pete Souza. What was it like to spend virtually every waking hour as Barack Obama’s personal aide, responsible for everything from keeping him on schedule to providing him with mouthwash, aspirin and the latest headline news? 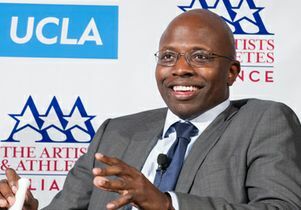 A small gathering of graduate students and faculty from the UCLA Luskin School of Public Affairs got the inside scoop last week from Reggie Love, former "body man" to Obama, during a July 18 lunch hosted by Luskin School Dean Frank Gilliam. Love talked about his path to the White House and the valuable life lessons he learned. 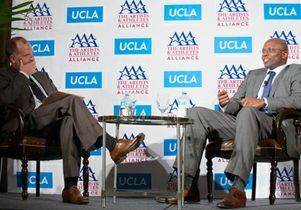 Later that evening, he spoke at an Artists and Athletes Alliance forum in Beverly Hills moderated by Jim Newton, a Luskin senior fellow and Los Angeles Times editor-at-large. 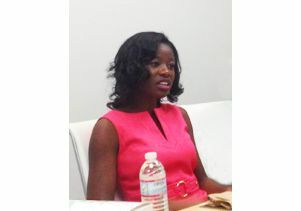 Over box lunches with the students in a Luskin conference room, the Charlotte, N.C. native recalled that "it was just 10 years ago that I was sitting in your seats, studying at Duke University, with a double major in public policy and political science." But he also played on the school’s Blue Devils basketball and football teams and had aspirations of joining the NFL. After graduating in 2004, he briefly played with the Green Bay Packers and then with the Dallas Cowboys for two years. "I thought it was the most amazing thing I could do … until I got fired," he commented wryly. Friends who were making big money at Goldman Sachs encouraged him to join them on Wall Street. But Love chose politics. "There was this senator from Illinois, Barack Obama, I was passionate about," said Love, who felt inspired by the politician’s book, "The Audacity of Hope." So in 2006, he decided to send his rsum to a staff member of then-U.S. Rep. Patrick Kennedy. "A week later," Love said, "I got a call from Pete Rouse," who was chief of staff in Obama’s U.S. Senate office. Following an interview with Robert Gibbs, then-Obama’s communications director, the 22-year-old Love landed a job as a staff assistant at an annual salary of $26,000. "It was one level above an intern," he recalled. "I basically started in the mailroom," where he quickly proved his mettle by setting up computer programs and databases to efficiently process a 10,000-piece backlog of unanswered mail. 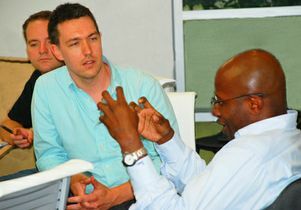 Public policy graduate students Jeremy Fuller (from the left) and Nathan Otto get the inside-the-White-House scoop from Love during his visit to the UCLA Luskin School of Public Affairs on July 18. When Obama’s run for the presidency began, Rouse asked Love what he’d like to do. "I told Pete, ‘I don’t know anything about presidential campaigns. Why don’t you tell me what to do?’" Rouse sent him traveling — two years as Obama’s personal aide on a campaign trail that covered nearly a million miles. "It was the education of a lifetime," Love said of crisscrossing America, listening to people talk to Obama about their concerns — fisheries in New Hampshire, farming subsidies in Iowa and health care across the country. "Wherever we went, there were always families who had someone with a serious health condition who were having a hard time financially," Love said. When Obama’s mother was dying of cancer, she was "trying to figure out how to pay a pile of medical bills," he said. "Her experience brought others’ experiences close to his heart" and fueled him with the resolve that enabled him to sign the Affordable Care Act into law in 2010. Love also learned lessons in patience and persistence on the campaign trail, he said. "You can’t win a campaign without doing a lot of things you don’t want to do. You’re tired, getting rained on, eating sandwiches every day." Worse yet, he said, "There were some very dark days" during the primaries when the polls and headlines were predicting that Hillary Rodham Clinton would claim the candidacy. 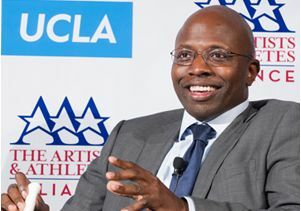 Luskin senior fellow Jim Newton, editor-at-large with the L.A. Times, interviews Love at an Artists and Athletes Alliance forum in Beverly Hills. One night, Love said, Obama wearily boarded the campaign bus and announced to all, "I can’t believe I let you talk me into running for president." Love offered, "Sir, if it’s any consolation, I’m having the time of my life," to which Obama responded, "You know what, Reggie? That’s absolutely no consolation to me." With the media full of discouraging news, Obama and Love came up with a new rule for those times when they weren’t actively campaigning: "No CNN, no MSNBC, no watching the news. We could only watch sports." When Obama’s victory led to the White House in 2009, Love continued as his aide and became something of a celebrity himself, profiled in stories for his expertise in all-things-Obama, from helping the president keep track of the dozens of people he met every day to being on-the-spot with stain remover in the event of food spills. When a New York Times reporter asked Obama if he had an iPad, the president joked, "I have an iReggie, who has my books, my newspapers, my music all in one place." Amanda Morrall, a second-year public policy graduate student at the Luskin school, asks Love about his 2011 decision to leave the White House to pursue an M.B.A.
Love also recalled many long conversations with Obama. "We talked a lot about the Oval Office. He had a sense of how people [all over the world] respect the presidency. 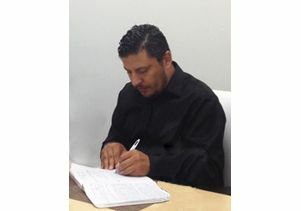 He wanted to do a great job representing the office." And the president, who once told a reporter Love was like "a little brother," also filled him in on certain facts of life. Among them: "When Paul Newman died, I said, ‘Oh, the salad dressing guy,' to which Obama retorted, ‘What? You have to go see ‘Cool Hand Luke’ and the rest of Paul Newman’s movies.’"
On long Air Force One flights, one reporter noted, Obama, Love and other aides often spent hours playing spades, a card game that also came into play on the night Osama bin Laden was killed in his compound in Pakistan, Love told guests at the Artists and Athletes event. While the U.S. military operation was overseen by the CIA and the president, Obama chose not to spend every moment in the situation room but nearby in an executive dining room with close aides, including Love. "We must have played 15 games of spades," Love recalled, interrupted by a steady stream of dispatches from the situation room. He added that when he left the White House later that night, after the president delivered news of bin Laden’s death, "there were thousands of people out on Pennsylvania Avenue, people crying and cheering. It was a very powerful, moving day." In December 2011, Love left the White House to complete his M.B.A. at the Wharton School at the University of Pennsylvania. "How did you know it was time to go?" Luskin public policy student Amanda Morrall asked Love. A graduate degree, Love explained, is an important credential in Washington, D.C. "I wanted to show people I earned what I have," he said. "I’m not just ‘Obama’s guy.’" He pursued an M.B.A., he added, because "politics is business — budgets and policies that impact people’s bottom lines." Love had begun the Wharton program while still working at the White House, but the combination proved too much — his grades were suffering and his work schedule remained unrelenting. He sat down with Obama to talk about it. "He told me, ‘You should focus on school.’" Love earned his M.B.A. last year and currently works for a private equity firm that seeks to return more jobs to American soil by creating new manufacturing infrastructures in the U.S.
Of course, Love admitted, he misses life at the White House, although he continues to stay in touch with the president by email and plays a basketball game with him now and then. But sometimes, he told the students, you have to choose between staying in a familiar situation or moving on to new challenges and opportunities to grow. Choose work you feel passionate about, he advised, and surround yourself with good people. "You all want to work in things you believe in," Love said. "But what’s really important is working for people you believe in … and who believe in you."